Back in 1998, after a tree fell onto her Kidwell farmhouse office, Frying Pan Farm Park Historian Yvonne Johnson (now park supervisor) was working in a temporary office in a construction trailer. 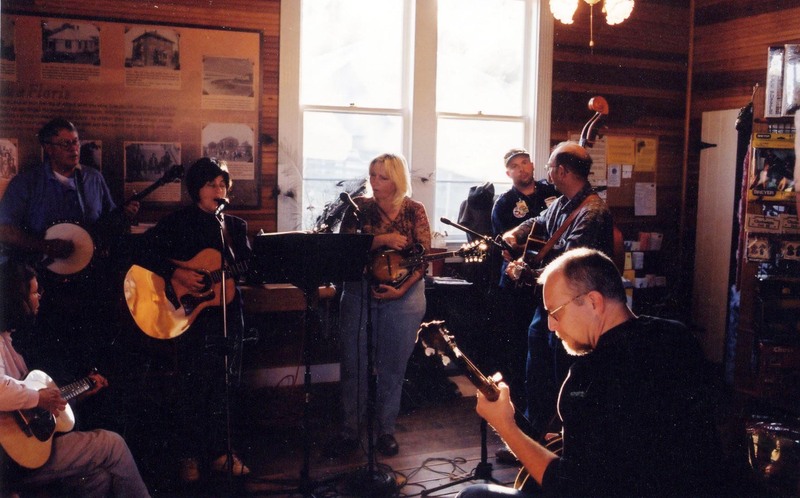 One day Debbie Billodeaux, a woman with a Louisiana accent and a little dog named Missy, knocked on the trailer door with an idea to allow musicians to gather and play on the front porch of the new Country Store. Johnson loved the Acoustic Jam idea and thought the sessions might draw a handful of people; however, in less than a year, 20 to 40 people were showing up to play at each jam. 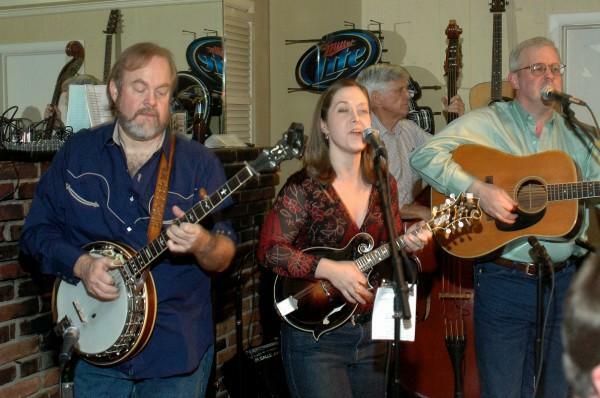 Since then, visitors have enjoyed Acoustic Jams every month, as friends come together in a warm, friendly setting to play harmonies on string instruments such as guitars, banjos, mandolins, dobros, fiddles and bass. According to Johnson, a couple hundred visitors might see the musicians play on a nice day. “It was so gratifying to see the response from the visitors,” Johnson said. “The Acoustic Jam started out as a once-a-month jam on the third Sunday of each month. I was inspired to start the jam when I saw the Country Store being opened up at the park in the spring/summer of that year. I thought this would be a perfect place to jam and, I must say, very convenient for me as I live close by. I liked jams because I could play with others, learn new songs, and the flexibility of a jam worked well with my busy schedule. 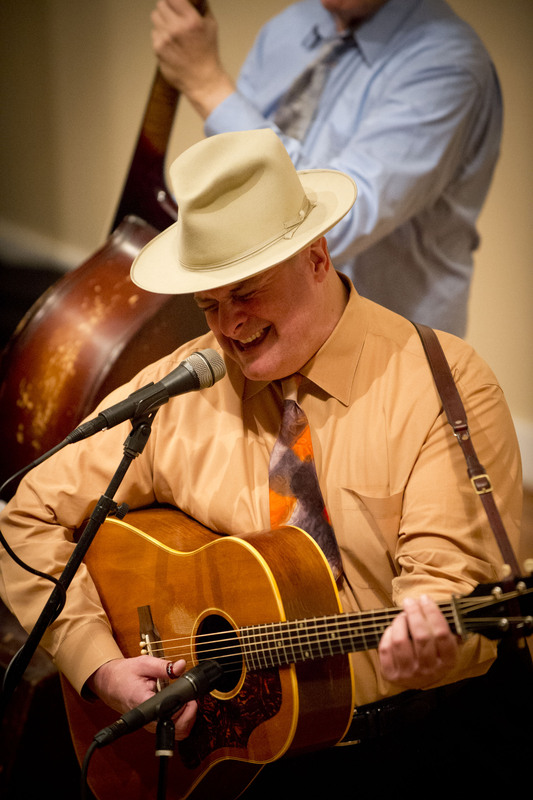 At the time I was going to the CABOMA jam (Capitol Area Bluegrass and Old-Time Music Association) in Arlington. Yvonne and I talked about how a jam would work and also be reflective of how people historically enjoyed music in a rural farming community. We intentionally set the Frying Pan jam up on the third Sunday so it would not interfere with the CABOMA jam in Arlington (second and fourth Sundays). “The first jam was attended by less than 10 people, but it grew steadily. It was usually bigger in the summer when people can be outside. The early jams were at the Country Store, which is near the playground, and it has always been interesting to see how kids react to live music and seeing a variety of instruments close-up. In the early years, my guitar teacher at Chantilly Music, Bill Suter, would often suggest that his students get out and play with other people. He would tell them about the jam and a dozen or more people came from his referral. I often send out an email reminder to those at the jam reminding them of the jam date and also telling them about other events and jams in the area. Jim Norman is a local resident and dobro and bass player who attends the jam, and he pushed for us to increase it to twice a month. In March 2002 we began holding jams twice a month. “The park staff typically will ask if there are a couple of people that can play music at the Farm Harvest Day or an event for the Friends group, and so we typically do that once or twice a year. Several years the jam has been the closing act on the performance stage at the 4-H Fair. Sometimes a picture of those performances showed up in a newspaper. The Frying Pan Jam was featured once as the cover story on the Herndon Connection. Through the years we have had a couple of people that show up to listen on a regular basis. Margaret and Ben Peck are in that group and I have a good picture of them sitting on the porch one sunny afternoon. There was another older lady who came regularly often requesting certain songs. 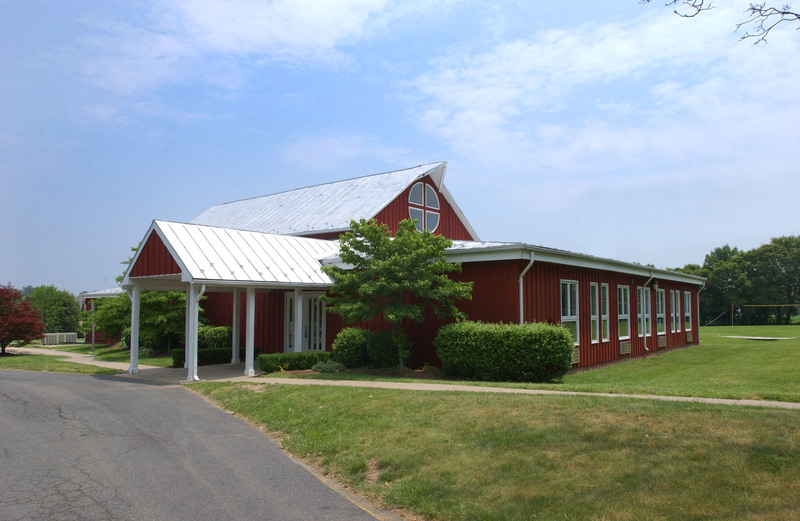 She grew up in West Virginia and had heard many early country legends sing as a child. She was a music fan and she would have her husband drive her over. When he was too old to drive, they would have friends bring them. I do not know her name, but I took a picture of her and a friend and gave her a copy. 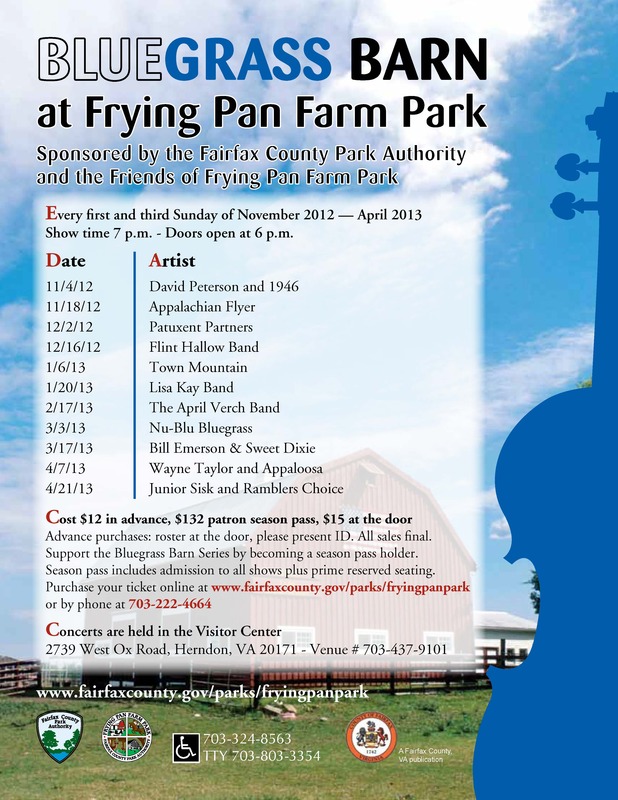 Acoustic Jams are held semi-monthly at Frying Pan Farm Park on the first and third Sundays from 1 to 4 p.m. 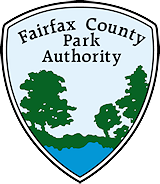 Written by Matthew Kaiser, Fairfax County Park Authority deputy public information officer, and Debbie Billodeaux, volunteer and park neighbor. This entry was posted in Uncategorized and tagged Acoustic Jam, Americana, Bluegrass, CABOMA, Farm, Frying Pan Farm Park, Herndon, Kidwell Farm, Music on January 31, 2014 by Fairfax County Park Authority.